A reading from the gospel of Luke 24:13-35. Listen for God’s word to us on this Third Sunday of Easter. And remember: according to the gospel of Luke, we’re still hearing of events that took place on the day of Christ’s resurrection. Listen. Have you seen the Chobani Fruit Symphony? It begins with a drummer setting the beat on a high hat cymbal, which is made of two coconut halves. The rest of her set includes some sort of melon as a snare and an apple and orange as her ride and splash cymbals. A synthesizer made of peaches, limes, and strawberries comes in next. Then an eclectic choir of singers begins: “What the world needs now.” Some sort of instrument, which includes hanging bananas, chimes in. The camera zooms out to show they’re all in a field under a massive shade tree with children playing in the background. The singers continue: “is love, sweet love. It’s the only thing that there’s just too little of. What the world needs now.” The commercial closes with a caption filling the screen: “Food Brings Us Together.” Then the final frame: Chobani: “Believe in Food.” . . . It’s an uplifting little ditty. About thirty seconds to show both the bounty and diversity of the land – food and people of every color combined in a little symphony of love (www.chobani.com/believeinfood). Believe in food. Food brings us together. In a web search for the Chobani commercial, another site pops up. “Oliving the Life,” it’s called. With a two minute read entitled: “Five Ways Food Brings Us Together.” It’s some sort of site promoting the health of The Mediterranean Lifestyle – generations gathering around tables filled with the kinds of food that have sustained people as far back as the days of Jesus. “The power of food,” the article begins. “Sharing food with others brings a wealth of benefits. These moments help us make friends, find love, and end hostility. Breaking bread together is a way to remove barriers and helps us explore new cultures and build stronger relationships when we socialize.” The article continues: “Food brings us together and your family can benefit in several ways” (www.olivethelife.com.au/five-ways-food-brings-us-together/). According to the piece, “sharing meals with the people you love, whether it’s just to catch-up over a simple dinner or partaking in a massive celebration” such meals lead to a happier, healthier life (Ibid.). Food. Brings us together for good. I’m guessing most of us don’t think of it enough. The power of food. Our need for food – not only to fuel our bodies, but also to sustain our emotional life, keep us mentally stable, and fill us up spiritually. Food literally brings us together – the grains of the earth entering us every time we take in a simple piece of bread. The fruits of the trees and the vegetables of the garden coming into us to give us what we cannot live well without. United with God’s incredible creation as we eat, we can call to mind our utter inter-dependence. We need this earth to survive as much as this earth needs us for its own continued well-being. Even if we dine without another human being, food unites us with this great, big, God-given earth. Thankfully, food also unites us with each other. If nowhere else; then at least around fellowship tables downstairs, or in the parlor, or right here in this sanctuary. Food has the potential to make strangers into fast, forever friends. If we open ourselves to dine with another, it’s likely we’ll push back our plates at the end of the meal to rise from the table different. Changed because we listened. And laughed. And along the way shared the stories that make us who we are. O the power of food. The beauty of a table. The miracle of being brought together every time we eat! I think they sensed it. Those friends distraught one Sunday night who make their way home from Jerusalem, back to the routines of life in Emmaus. The story goes that a stranger came walking along – interrupting the conversation in which they are trying to process their sadness. He nearly calls them fools, unwilling to believe. And yet, they invite this strange One to stay. Strongly they urge him, the scripture records (Luke 24:29) because night is falling. The day comes to a close. And what’s the first thing these two do as soon as the stranger agrees to come in? They set the table. Perhaps a few olives, some hummus, a scrap of bread. Some fruit of the vine – whatever they can find upon arriving back home after the long weekend away. Making do, they sit down together — unaware that by the time the meal is over, their lives never will be the same. At some point around the table, the stranger takes. Blesses. Breaks. Then gives the bread. Granted, they hadn’t been involved in that act as we have every first Sunday of the month and High Holy Days of the year too. But according to scripture, they had been present at least once on a hillside as multitudes were fed, and again in an upper room in Jerusalem just a few days prior. Though scripture remains silent about many of the day-to-day aspects of Jesus’ life during his three years of ministry; most likely he gathered daily for a meal with those who had decided to follow this astounding rabbi. Yes, this was an act by One they had seen before. . . . In Emmaus, the table brings together the two hosts with The Host. Food opens their eyes to the face of Love, risen now and ever in their midst! That’s the power of the table. The strength of broken bread. The liturgy reminds us monthly: every time we eat the bread, each time we drink together; we recognize the Risen One in our midst too. In the faces of each other. In the eyes of those we’ll come to meet the next time we sit at table together. And just in case we wouldn’t catch the truth from words, he commanded the act for us to know deep within: believe in food. For indeed food brings us together. Taste. Drink. And be glad! 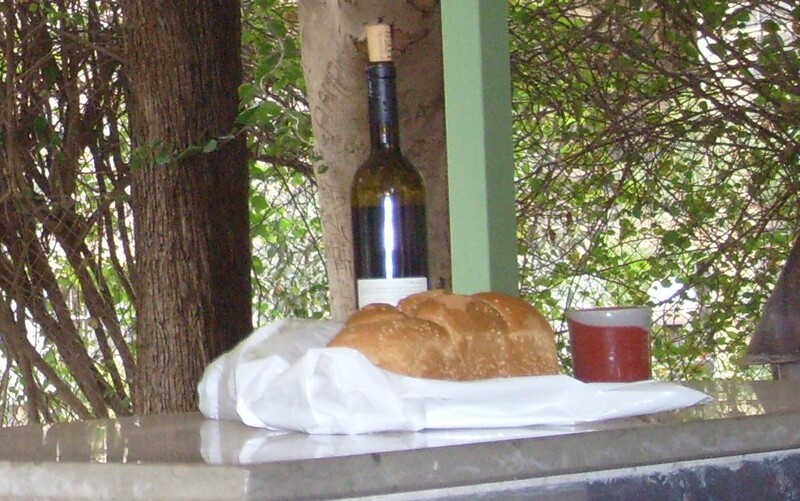 This entry was posted in Sermons and tagged 30 April 2017 sermon, Bread, Chobani Food Symphony, Eating Together, Food, Luke 24:13-35, Reliance upon Earth, Sharing Meals, Strangers and Friends, The Mediterranean Lifestyle, The Road to Emmaus, The Table, Third Sunday of Easter Sermon on May 2, 2017 by RevJule.